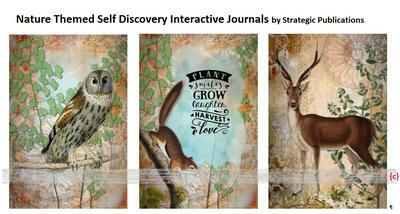 Finally started working on a new paperback self discovery interactive journal... using a "nature" theme for the graphics and journal prompts. I'm using self reflection statements and self discovery prompts, on beautiful nature images. Still learning how, don't know photoshop so it requires a lot of ingenuity on my part to work it all out. Hopefully the first one will be available in the next week or so. Lots more new Strategic Publications releases of 2018 Diaries. Gorgeous designs in matte finish paperback covers! New designs being released every week, in both 6 x 9"and 8.5 x 11"
So take the time to think about the ESSENCE of what makes you FEEL GOOD, what makes you feel happy, what makes you feel a success, what makes you feel loved. And plan ways to have or do more of those things in the year ahead. And get yourself ORGANIZED... time management is crucial... don't waste time and energy... make the effort to write down your activities and plans... measure, monitor and track how effective you are... ponder how to become better... and you WILL! And get yourself a beautiful and inspiring Diary or Planner. Yes, like one of the ones I have designed for you. They work. They make you happy. Use them. Join in and write your own page! It's easy to do. How? Simply click here to return to Books & Publishing.